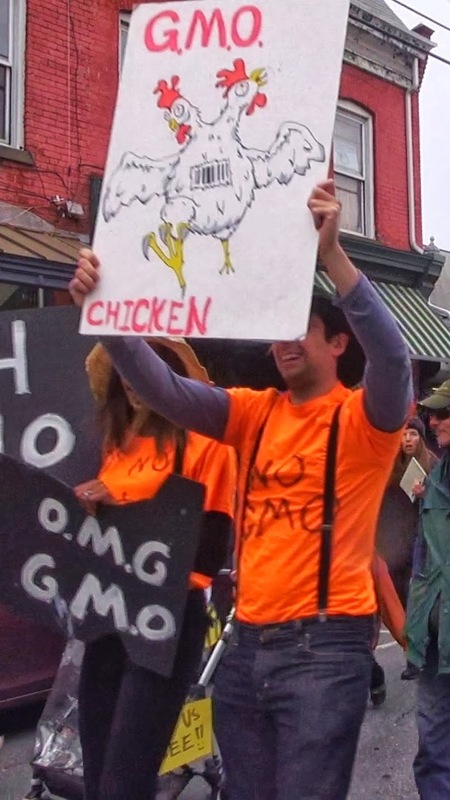 Hudson Valley for No GMOs: Five Reasons to March against Monsanto this Saturday! The American Academy of Environmental Medicine prescribes a non-GMO (genetically modified organism) diet saying "several animal studies indicate serious health risks associated with GM food consumption". The consensus of scientists at the FDA in the 1990's was that GM food could produce allergies, new toxins, new diseases and nutritional problems and that they required further study before being brought to market. They were overruled by a political appointee named Michael Taylor, who before writing the FDA policy on GM foods (saying they were the same as any other food) was an attorney for Monsanto. After his FDA stint, he was rewarded by being made vice-president of Monsanto, He is now our "food safety czar". Because of corruption in high places, GMOs are now in over 75% of the foods in our supermarkets. There has never been a long term feeding study on the effects of eating GM foods on humans. Not one. In animal feeding studies, GMOs have been linked to organ damage, infertility and premature death (65 health risks of GM foods). Fact: GMOs have been put in our food for the past 17 years with NO studies to see if they are safe if consumed for longer than three months. Last year, for the first time, researchers looked at the consequences of eating a GMO diet over a lifetime. The study by Gilles-Eric Séralini, a professor of molecular biology at the University of Caen was published in the peer-reviewed Food and Chemical Toxicology Journal. 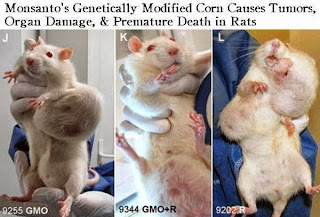 The landmark Séralini study showed that rats fed GM, RoundUp Ready corn had an increase in mammary tumors and severe liver and kidney damage and that 50% of the males and 70% of the females died prematurely. 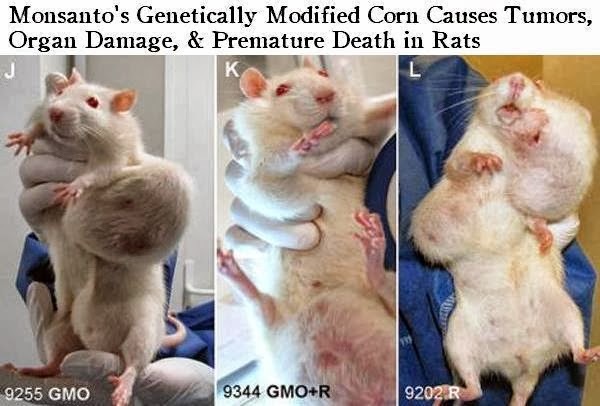 In Séralini's two year study, the damage did not start showing up until the rats had eaten GMOs for four months, one month after Monsanto's studies all abruptly end. As they always do, Monsanto and industry-linked GM proponents attacked Séralini viciously, but their criticisms have proven false. For instance, they criticized the type of rat Séralini used, but he actually used the same rats used by Monsanto in their studies. More are speaking out about the orchestrated campaigns of harassment directed at independent scientists and hundreds of scientists and academics signed a letter praising Seralini's methodology and results. Also the European "FDA" recently reversed course and said future experiments about the long-term effects of GMOs on animal health should adopt Séralini's methodology, "affirming that the study is, in fact, valid." Sadly, the effects of eating GMOs for a lifetime are not pretty and cannot be ignored. Monsanto's RoundUp is Poisoning Our Land, Air, Water and Us. 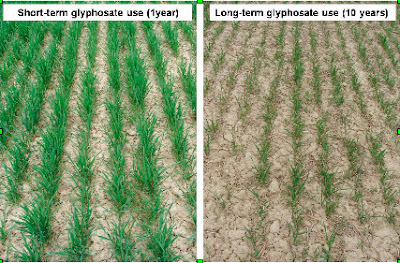 You know you are in trouble when glyphosate, the main ingredient in RoundUp, is found in 60 to 100% of air and rain samples in farming regions in Mississippi and Iowa. Imagine that - it is so prevalent that it permeates the air we breathe and poisons the rain. Glyphosate is a known endocrine disruptor and has been linked to birth defects since the 1980's. Our country is drenched in this herbicide. It kills everything in its path, except for the RoundUp Ready plants that are genetically modified to survive massive amounts of the toxic herbicide and not die. They are left standing, but are less vital, nutritionally inferior and have higher concentrations of RoundUp that is in the plant itself and cannot be washed off ! It destroys beneficial organisms and promotes virulent ones in the soil and in you. 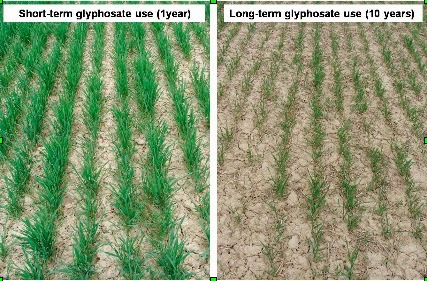 Monsanto likes to repeat the lie that GM crops reduce pesticide use, but because of the explosion of super weeds and super bugs that have grown resistant to glyphosate, GM crops have actually increased pesticide use by over 400 million pounds and more lethal pesticides are now required. We are now spraying the main ingredient of Agent Orange (2,4-D) on our food and the biotech industry has created Agent Orange Ready crops! * Monsanto has already planted "ground breaker" demonstration plots of 2.4-D and dicamba resistant crops. Both 2.4-D and dicamba are highly volatile and are known to drift (up to 100 miles!) putting fruit, nuts and vegetables at risk for severe damage. We also can learn from the hard lessons experienced by communities around the world that have suffered the devastation that accompanies GM crops. In India, over 250,000 farmers, most of them growing Monsanto's Bt cotton, have committed suicide. 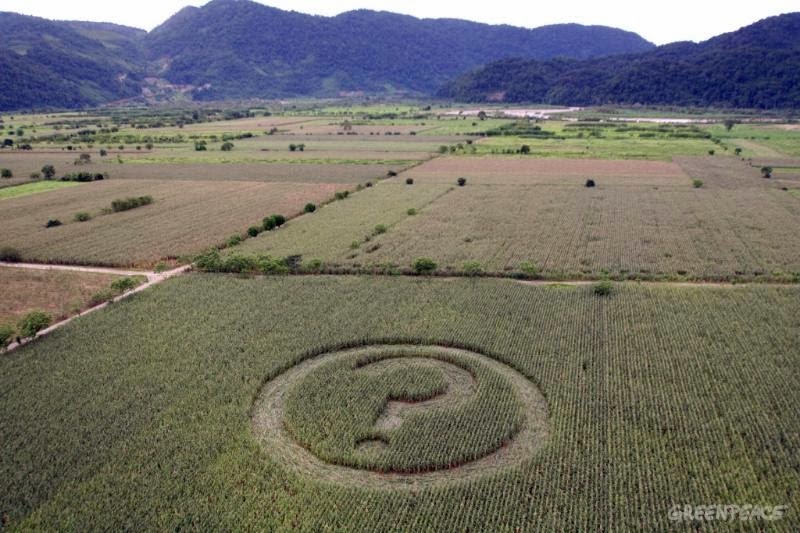 They reached a state of desperation when Monsanto's promises of higher yields failed. They also became debt slaves to Monsanto, having to buy GM seeds that increased in cost every year. This is one of the greatest, under-reported tragedies of our time. Monsanto and others in the biotech industry have been gobbling up seed companies (they control half the seeds in the world) and are now phasing out conventional seeds. In 2009, nearly half of the farmers in Illinois did not have access to non-GE corn. It is next to impossible to find non-GM soy seed in Brazil or South Africa. This has nothing to do with "feeding the world" and everything to do with "maximizing profits at any price". “If some people are allowed to choose to grow, sell and consume GM foods, soon nobody will be able to choose food, or a biosphere, free of GM. It’s a one way choice, like the introduction of rabbits or cane toads to Australia; once it’s made, it can’t be reversed.” — Roger Levett, specialist in sustainable development. At a conference in 1999, Arthur Anderson (found guilty of criminal charges in 2002) asked Monsanto executives what an ideal world would look like in 15 to 20 years. 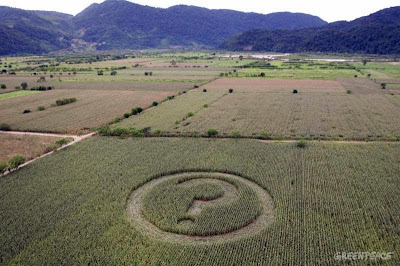 The executives replied, a world in which 100% of all commercial seed is genetically modified. And based on Monsanto's lies and predatory business practices, we know they will pursue that goal by hook, or by crook. In just over 15 years, they have been able to genetically engineer 90% of US corn, soy, sugar beets, canola and cotton; ingredients that are in virtually all the processed foods you eat and feed your family. But you don't know, because we are also one of the few industrialized nations on earth that does not label GMOs. In 2006, two varieties of GM rice (never approved for cultivation in the US) extensively contaminated the US rice supply. In Canada, organic canola has been destroyed by contamination. In Spain, GM maize is making the existence of organic corn nearly impossible. In Mexico, 150 unique varieties of corn have been contaminated by GM corn and Monsanto has no idea where GM wheat came from in a field in Oregon. To see the growing number of cases of contamination check out the GM Contamination Register. Monsanto says the co-existence of GM and conventional and organic is "peacefully occurring around the world." What they are really saying is that they are getting closer to their goal of genetically modifying the entire world food supply. some people are allowed to choose to grow, sell and consume GM foods, soon nobody will be able to choose food, or a biosphere, free of GM. It’s a one way choice, like the introduction of rabbits or cane toads to Australia; once it’s made, it can’t be reversed.” — Roger Levett, specialist in sustainable development. 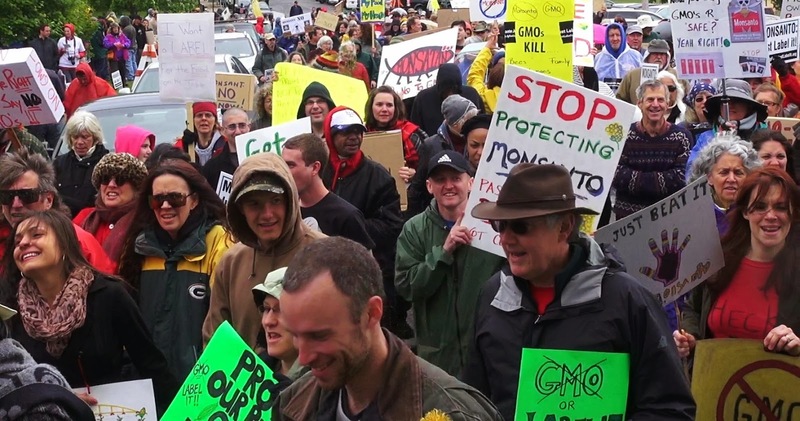 Thanks to activism, the Monsanto Protection Act is dead. Stopping TPP and getting labeling of GMOs in NYS are next on the agenda! Last May, the first global March against Monsanto woke the world with a voice over 2 million strong that said we will not allow the poisoning of our food supply! It was exhilarating to see so many in all parts of the world were rising up for food safety, food choice and for an end to RoundUp pollution killing our earth. About 400 attended the rally and march in New Paltz! We were especially motivated to make a strong public statement because congress had just anonymously snuck in the "Monsanto Protection Act" in the dead of night, that said Monsanto could plant GM crops even if it was shown they were approved illegally and could cause public or environmental harm. That was the last straw. Hundreds of thousands alerted Congress that this was not going to be tolerated. Thanks to champions like Senators Merkely D-OR and Mikulski D-MD, it died a quiet death in the Senate on September 27th. Activism works! The New "Monsanto Protection Act" is the "TPP- The Terrible Plutocratic Plan"
Unfortunately, although it has not gotten as much attention as the "Monsanto Protection Act", The TPP, the Trans Pacific Partnership is much worse. Monsanto is heading up the agricultural division of this huge trade treaty which is more about the consolidation of corporate power over all of us rather than trade. The TPP is a Trojan Horse that gives Monsanto the right to sue any state or country that dares say that GMOs must be labeled. Monsanto, under the TPP, could sue, saying such labeling could hurt their future profits. All cases would go before a panel of three judges, who are corporate attorneys! Guess who wins? The TPP strips the US of its sovereignty, democracy, public safety, environmental protections and more. It must be stopped. The first step is awareness- please read more and share. Feel free to make a sign (some will be provided and some can be made there) and if you like, dress up for the march! You can come as an endangered butterfly or bee, a Zombie from eating too many GMOs, a money grubbing Monsanto exec, a pesticide -producing ear of corn- use your imagination and have fun with it! See you there! *March against Monsanto is teaming up with children of Vietnam Veterans whose fathers were sickened or died from Agent Orange. Just like in Vietnam the suffering continues. The children and grandchildren of the vets suffer higher numbers of birth defects and illnesses. For the first time they are speaking on the same day and all are speaking out against GM foods made by the company that sickened their fathers and hurt them.